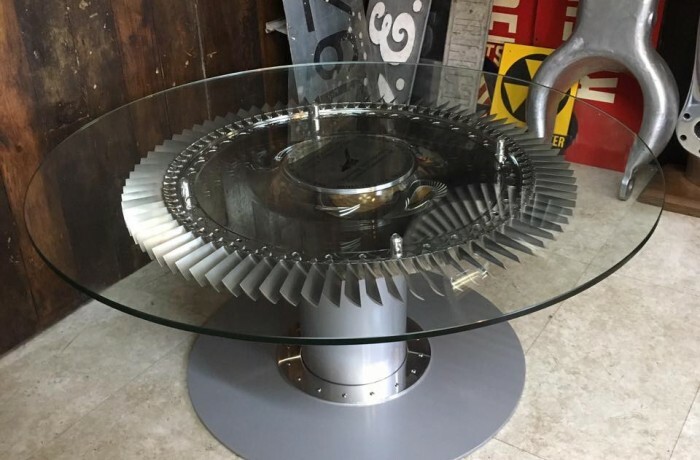 'I would like to thank you and Martin once again for the wonderful job you did in transforming our Concorde compressor disc into a phenomenal piece of art. The whole process was a pleasure from talking through the idea to the service provided by Ashby Interiors. What was of particular note was the way we felt included in the progress of the work thanks to your weekly updates and regular consultations for instance the idea to add an engraved disc with the relevant information was a stroke of genius. The only problem I have now is that every time I walk past the table I find myself staring at what is just an unbelievably beautiful item, tough to get any work done! An extract from an email from the customer - this exciting piece was commissioned by a company who work within the aerospace supply chain and wanted a bespoke piece of aerospace for their reception area. The compressor disc was already in their possession having been purchased some years previously.